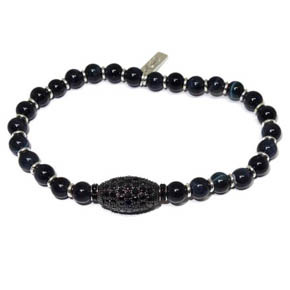 Lazaro SoHo is well known for handstrung beaded bracelets with a collection that includes classic shamballa bracelets and other bracelets for men handmade with kynite, agate, ruby, sapphire, onyx, lava and even bone beads. 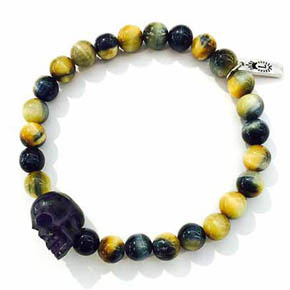 This adjustable bracelet is made from 12mm blue tiger's eye beads surrounding a 21x21x13mm brass skull. 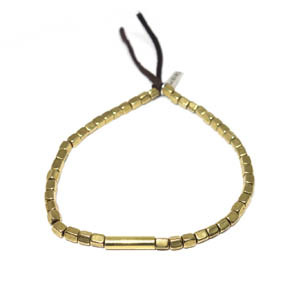 Also featured on this bracelet are two 19x5mm pointed brass tips on the adjustable pull cords. 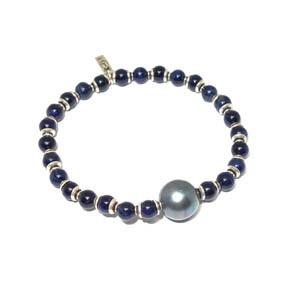 This bracelet features a stunning 12mm South Sea pearl surrounded by 6mm blue tiger's eye beads. 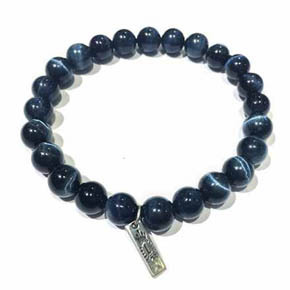 Each blue tiger's eye bead is framed by 5mm sterling silver bead caps. 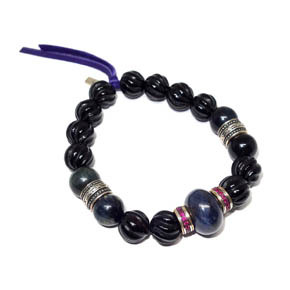 This handsome bracelet features a 17x12mm blue tiger's eye center bead framed by a 10mm ruby & silver roundell on each side, 11mm carved onyx, 12mm blue tiger's eye, and two hand shaped 10x7mm sterling silver rondelles. 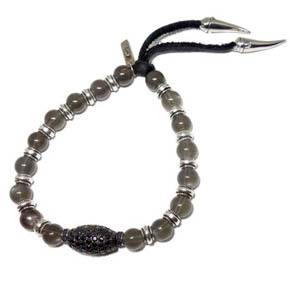 This charming bracelet features 12mm onyx beads, two 10x7mm sterling silver roundells, and a 14x11mm sapphire center bead. 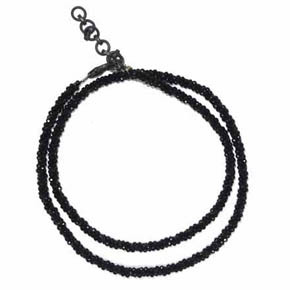 Each onyx bead is spaced with 6mm jump rings. 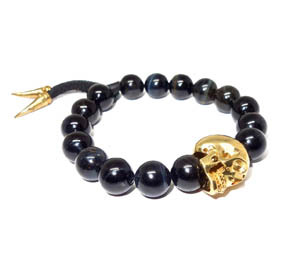 Get the Midas touch without breaking the bank with our squared brass bead bracelet. 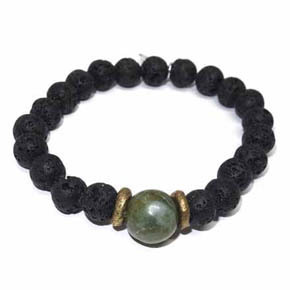 This handsome bracelet featuring 4x3mm squared yellow brass beads surrounding a 15x4mm tubular bead on a leather cord. Made to fit an 8in wrist. 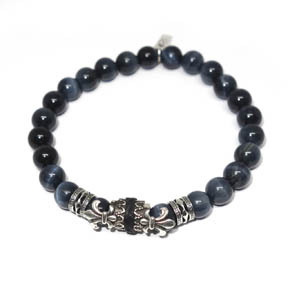 This radiant bracelet features 8mm smooth rounded beads made from blue tiger's eye and an 8mm handcarved sterling silver fleur de lis accent bead and 7mm roundells. 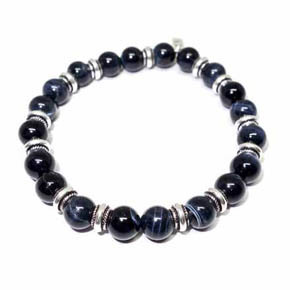 Blue Tiger's Eye is said to create a feeling of emotional balance and focus. Made to fit an 8in wrist. 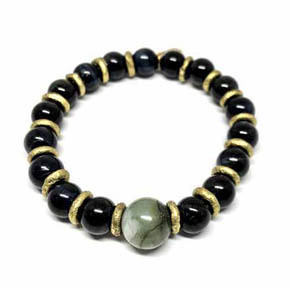 This handsome bracelet features 10x8mm dark jade cabochon beads spaced with 6mm yellow brass roundells, and a 13mm rounded jade accent bead framed by 7mm sterling silver roundells. 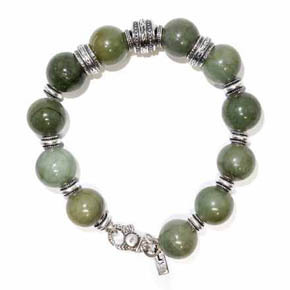 Jade has long been revered in many cultures as a symbol of serenity, harmony, and is said to bring good luck & friendship. Made to fit an 8in wrist. 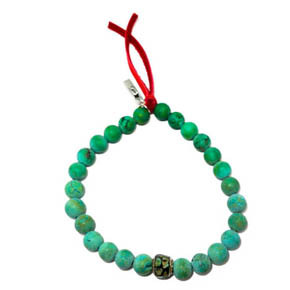 This bracelet features vibrant 7mm and 10mm turquoise and ceramic beads. 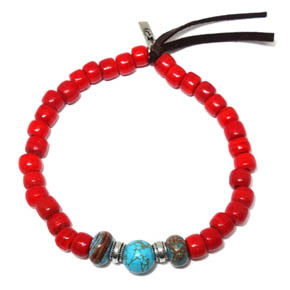 The silver spacers make the perfect accent to the vivid red and turquoise beads. 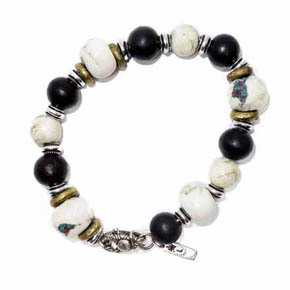 This is a “mixed-media” bracelet featuring elements of ceramic, turquoise and wooden beads - a prime example of base elements being polished to their most beautiful and most appealing. The art of turning materials such as woods and ceramics into jewelry has been a hallmark of a master craftsman -for the value is derived from their work. 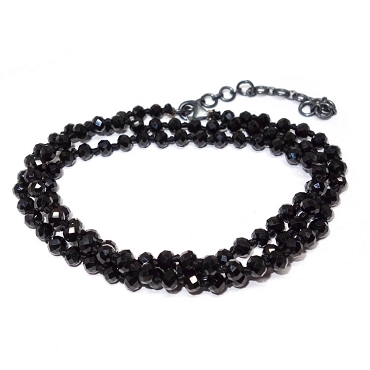 This piece follows that craftsman tradition closely and makes for an incredibly alluring and comfortable wrist accessory. 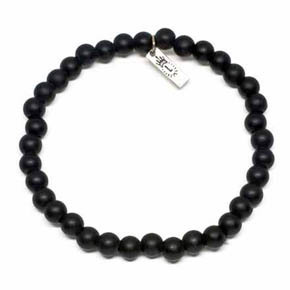 Unconventional and refined, this bracelet pairs well with other bracelets to form custom stacks. 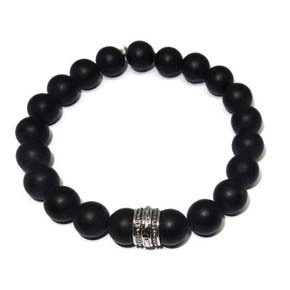 Major Features: 8mm Wooden Beads Mixed With 7mm Red Ceramic beads. 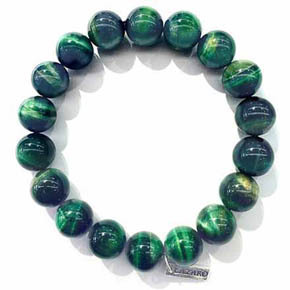 The Turquoise beads measure in at 10mm. The roundels are made from Sterling Silver. The feather has been thought to be a message from the gods. This bracelet features our signature hand-carved feather wrapped around our famous crocheted leather cuff bracelet. 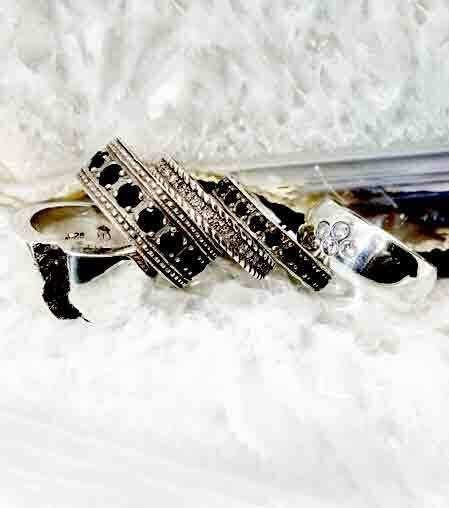 The cuff-ends are sterling silver in a turned pattern. 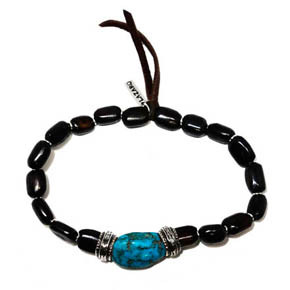 Native americans, Egyptians and tibetans have held the turquoise stone to be the metaphysical and healing stone. 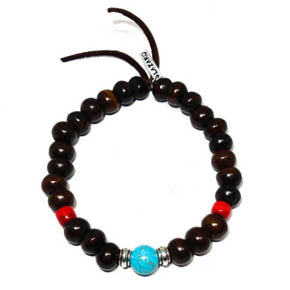 Theis bracelet features an inlaid mosaic chip turquoise bead flanked by solid tibetan turquoise beads. This mixed gemstone piece utilizes sapphires, moonstones and silver to create an accessory that dances in the light and catches the eye. While it can accessorize with a larger wrist stack, it is also a gorgeous stand-alone piece of jewelry. Sapphires, silver and especially moonstones, while beautiful, have also all had a long history associated with heightened perception, dreams, and clairvoyance. Major Features: Multiple 8mm moonstones separated by 7mm sterling silver roundels surround a centerpiece of multiple 5mm Sapphire roundels (17mm x 11mm spinel roundel). A leather tie with silver detailing maintains the structure. 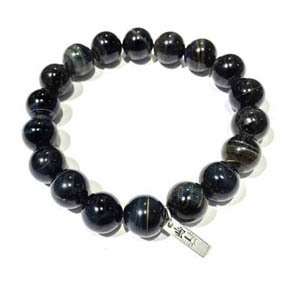 Contemporary men's beaded bracelet made of Tiger's Eye and sapphire beads with sterling silver and spinel. 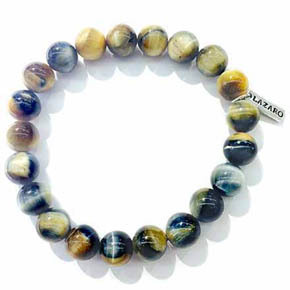 Tiger's Eye is a variety of macrocrystalline Quartz believed to support happiness, balance and strength of will. 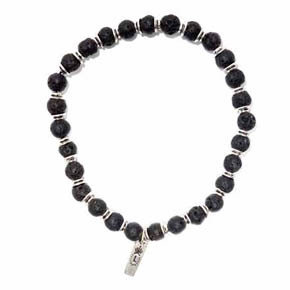 This inky black bracelet made of Onyx with a fastening of sterling silver is a trendy and contemporary take on traditional men's beaded bracelets. 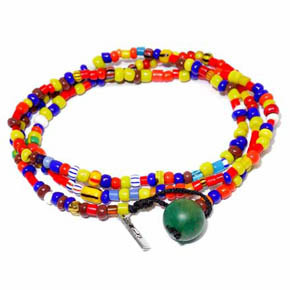 Make a kaledioscopic splash of color with mixed ceramic beads, this fun-loving bracelet also doubles a necklace. This 2-in-1 is the summer essential you need. Each is handmade, and will vary in color and design. 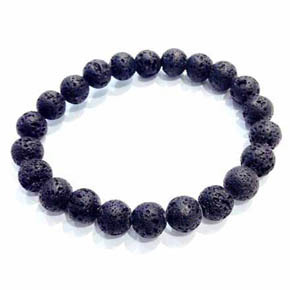 The creation of nature, a gift from a higher power, each lava bead handsomely unqiue. 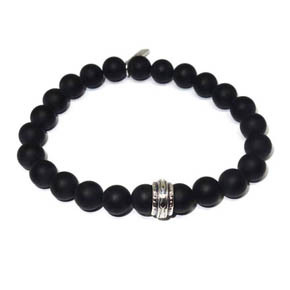 The 6mm lava bead pairs well with sterling silver roundel spacers, connecting you to the world and beyond. 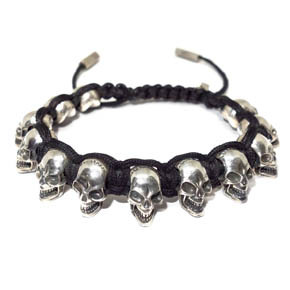 This bracelet is made to fit an 8-8 .5" wrist and is strung on high quality parachute elastic. No need to feel blue here, this lively piece featuring blue ceramic beads, will only brighten your arm. 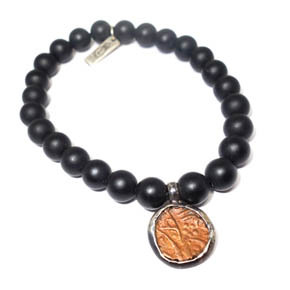 Ceramic beads envelop a sterling silver roundel and deerskin leather trimmings. 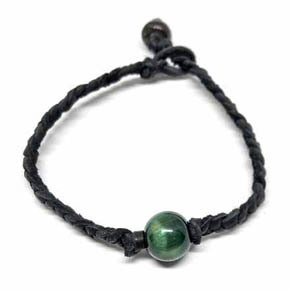 Pair this with other bracelets. 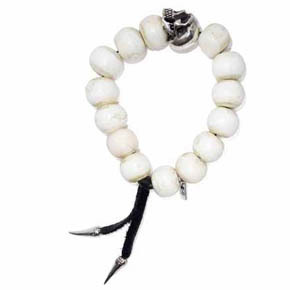 Be a great explorer of style, adventure awaits with milky conch shell beads surrounding a hand-crafted sterling silver skull. 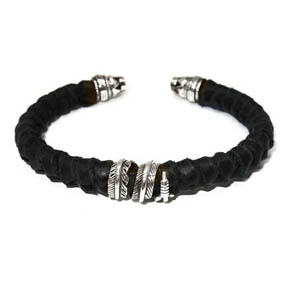 Deerskin leather trimmings give this bracelet a completed look. 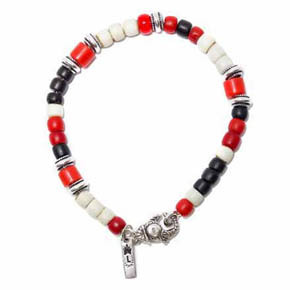 As Summer begins, choose fresh wardrobe accessories, find a delightful Summer look in this bracelet featuring red, black, and white ceramic beads mixed with classic sterling silver roundels. 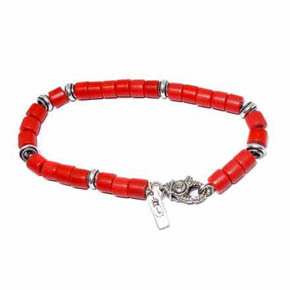 Sizzling Summer colors the wrist, bold red African trade beads envelop sterling silver roundels. A lively and colorful wardrobe splash complete with closure clasp. 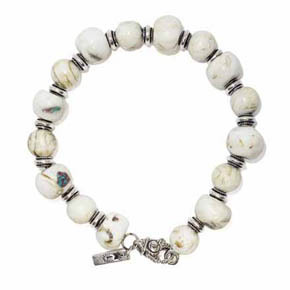 Coastal charisma adding ambiance to the arm with marbled conch shell beads, conch beads feature multi-color pops throughout the bead and is surrounded by sterling silver roundels. 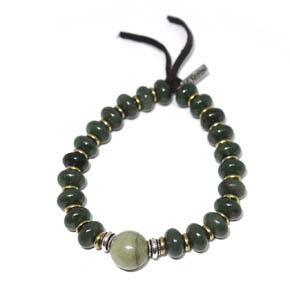 Glorious green jade reminiscent of a the green that follows the Summer coming to life. This is a classic addition to your wardrobe and features sterling silver roundels and clasp that set this look apart. Important Details: 13mm Jade beads, 7mm sterling silver roundels, and 11mm center sterling silver roundel. Clasp may vary. 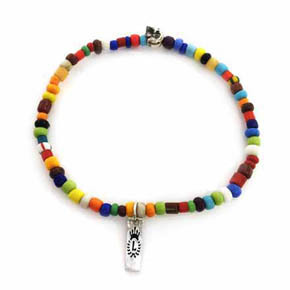 Go fierce with your Summer style with conch shell beads displaying small pops of mixed color and surrounded by black wood beads, as well as, brass and sterling silver roundels. 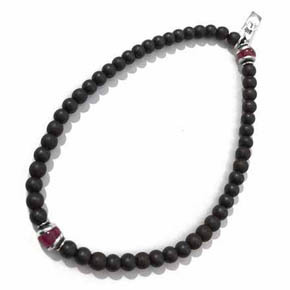 Features a sterling silver closure clasp. 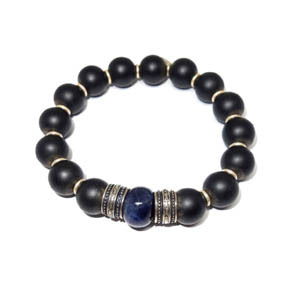 Within the tigers eye lies a mystical beauty, the deep, sapphire-blue beads tells a story. 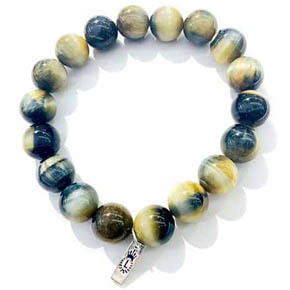 The tigers eye beads are enveloped between sterling silver roundels offering a classic, clean look. 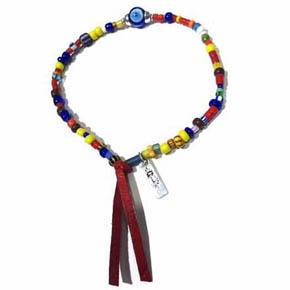 This bracelet is made to fit an 8-8 .5" wrist and is strung on high quality parachute elastic. 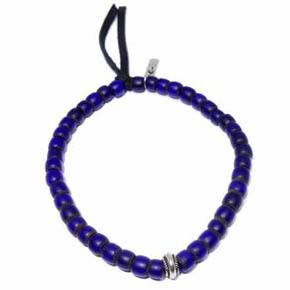 Limited edition matte lapis reminds of icy blue waters bringing the sea alive, lapis gets a pop from sterling silver roundels placed throughout the beaded bracelet. 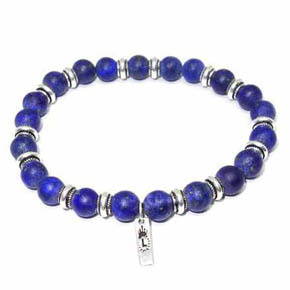 Pair with other lapis bracelets or wear as a stand alone piece.